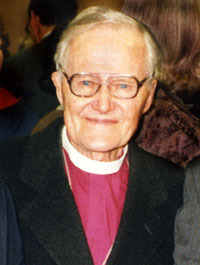 Lesslie Newbigin in 1996. Image courtesy of Wikipedia. I consider it a bittersweet honour to conduct funerals. I have the opportunity to model hope and love in the darkest of times. Today, upon visiting one of my church members who had lost her husband, I discovered that some decades ago she had been secretary to one of my theological heroes – Lesslie Newbigin. I was glad only to discover that at the end of the visit, otherwise I fear the time might have been derailed. But also today, a friend who is an Anglican priest shared on Facebook this obituary of a Catholic woman from Wisconsin. Rarely have I come across an obit quite like this one. Whether or not you express your faith in the same way as this lady, I invite you to read it, enjoy it and be challenged by it. Posted on September 12, 2013, in ministry and tagged funerals, Lesslie Newbigin. Bookmark the permalink. Leave a comment.